St. Peter's Church recap and photo gallery. 3rd & Pine, in Society Hill. Hop in your time machine, folks, and get ready for the oldest Project adventure yet. 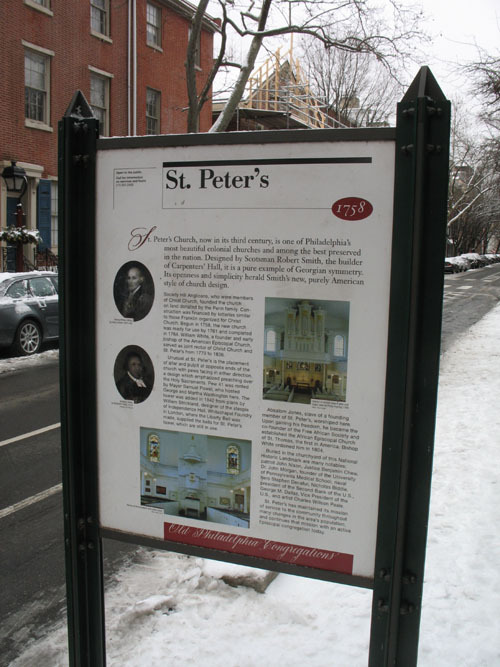 St. Peter’s was founded all the way back in 1758, and its building was constructed in 1761. That’s right, 1761, two years older than now-runner-up Old St. Mary’s. Old vs. 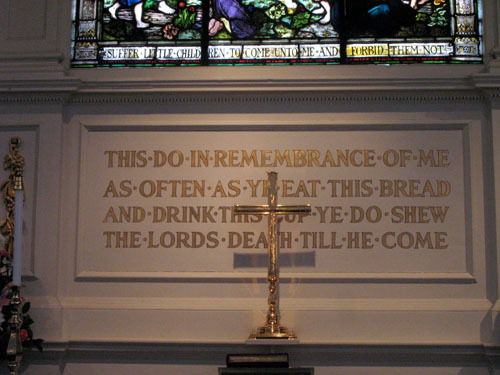 Older Churches: That’s certainly the case with St. Peter. According to its fine website, the church was built in mid-Georgian auditory style. What that means for you is that you’re treated to a classical colonial church. 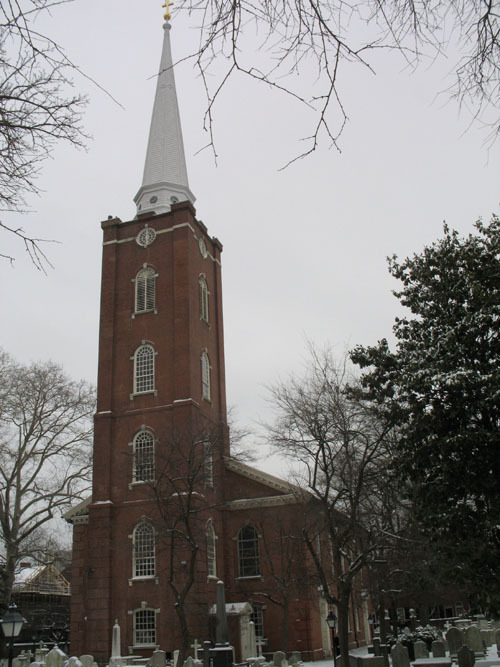 Red brick, clean lines, clear glass windows — and box pews. Very rare site, those. Ok, so if colonialism isn’t your thing, St. Peter’s isn’t much to look at. But that doesn’t mean it’s devoid of cool things. There’s a cleaving balcony. 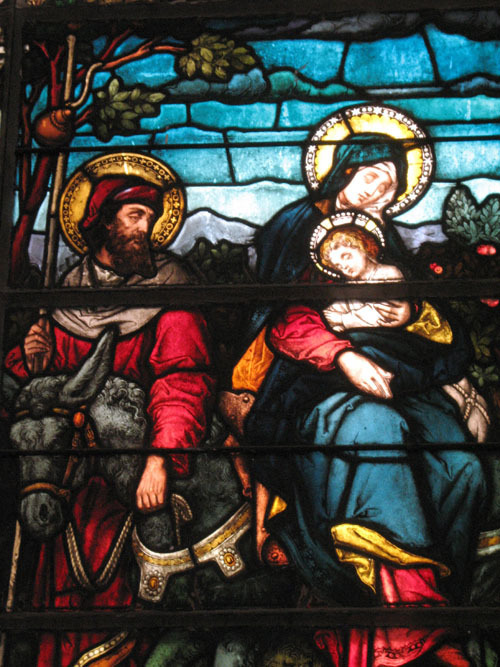 There are three really nice windows — one behind the altar, and two up in said balcony. 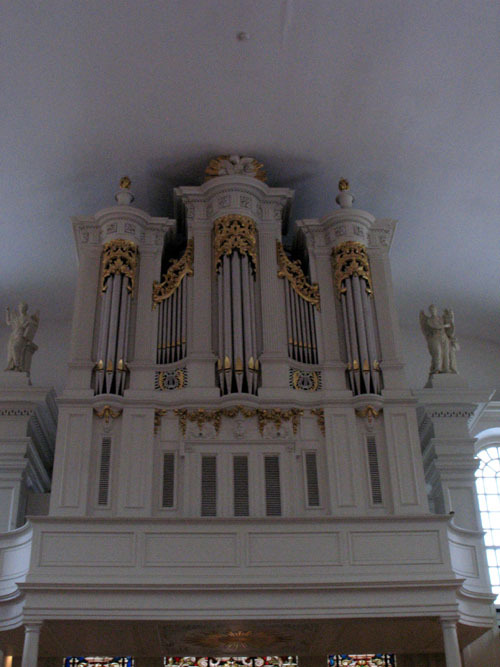 A grand, gold-trimmed organ. 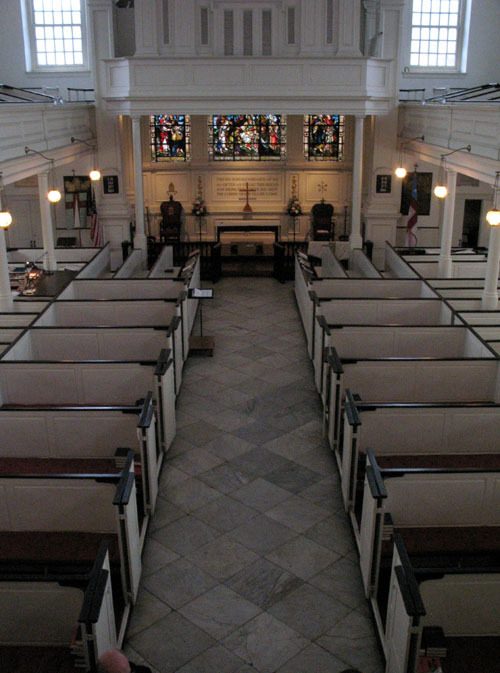 An unusual dual end construction with the altar at one end and the pulpit on the other, which works better in theory than in practice, since most of the pews only face one way. 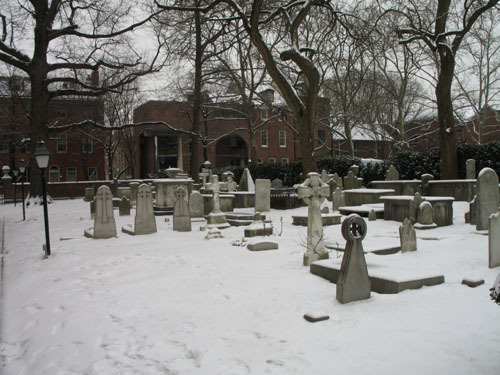 And, lest I forget, a very expansive graveyard that’s home to some pretty famous Philadelphians. We’ve seen more architectural impressive churches, and we’ll see more again. But for 1761, what do you really expect? 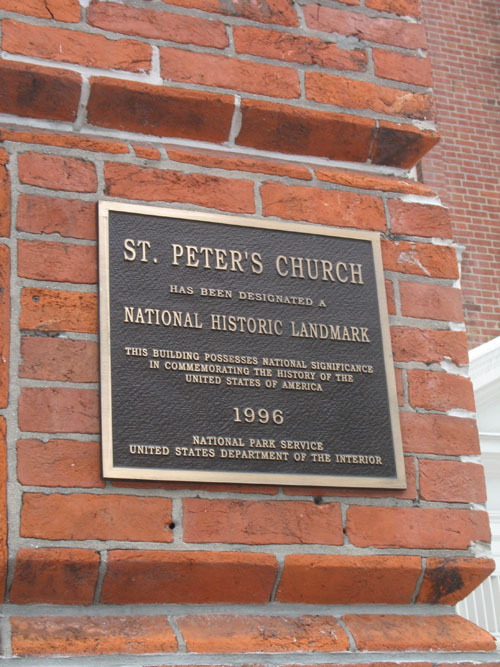 St. Peter’s is a great period artifact with some nice features and a vibrant sense of history. That’s enough for me — and should be enough for you. 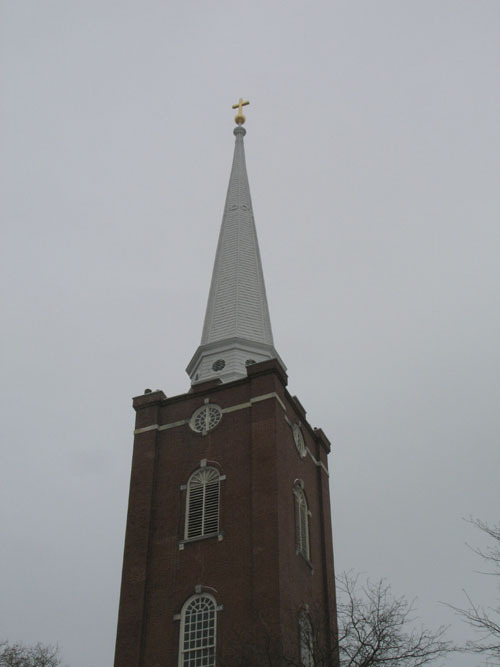 Look for it: The prominent spire was actually added in 1842, 61 years after the church was built. 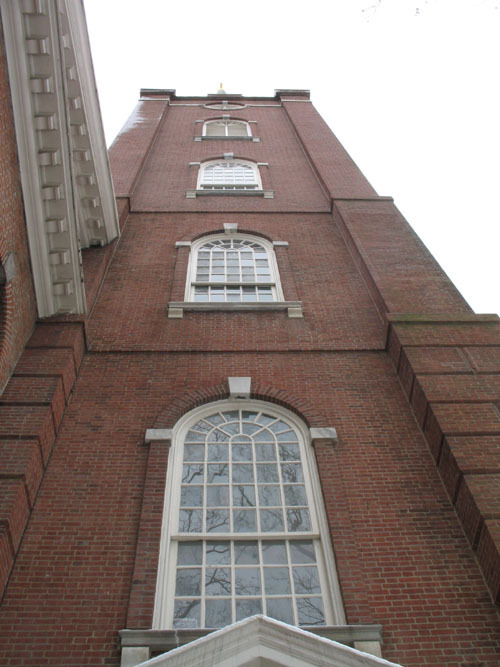 Living History: None other than George and Martha Washington frequented this church (the George and Martha Washington), and even had their own box. God, I love this city. 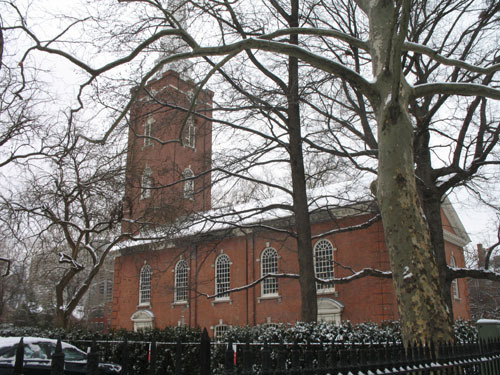 Well, they don’t come out and proclaim themselves to be rich, like St. Mark does (although if any neighborhood could say that, it’d be Society Hill), but they are, or are at least doing very well. Their congregation numbers over 400, mass attendance is robust, and they’re looking for opportunities for space expansion. More importantly, they foster a strong sense of community. Volunteer opportunities. A knitting group. A book club. Even stuff for the young people, or TNTs, as they call them (twenties 'n thirties), including brunch! Their emphasis on youth is impressive, as evidenced firsthand, as I sat next to a young lady who introduced herself and asked if I was also new to the parish. Her interest faded when I explained my nomad status, but it shows how strongly St. Peter’s tries to build community. I was also reminded that church architecture isn’t necessarily a draw with the ladies. Girl: Oh, you’re going to take pictures? Me: Yeah, you’d be amazed at how popular church architecture can be. Sigh. I either need better lines, or more receptive women. Or maybe I should just stop trying to pick up girls at church altogether. Anyway, this is a pretty robust parish. There’s also a K-8 grade school, which looks fairly accomplished if a little small. An eighth grade graduating class of 13? Yikes. The school is ostensibly independent from the parish, but seems pretty intertwined in form and function. Give the Protestants credit. They don’t usually hit architectural home runs, but they build communities better than anyone else. They’re also smarter than most when it comes to surviving and thriving within their financial means. That’s refreshing at a time when so many other parishes and religious schools are on the chopping block. Society Hill, man. Come on. It’s a nice, nice part of town that shouldn’t worry you in any significant way. Getting to 3rd & Pine and parking there is more troublesome, but like I always advocate, public transit is the only way to travel in the city. If you still want to drive, there are quite a few paid parking lots in the vicinity of nearby South Street. You have to love that the church has an audio tour than you can both download from your computer and dial into using your cellphone.